Hillsboro's Spa & Fitness Center is a wonderful place for Members to spend a little time with their minds and bodies. 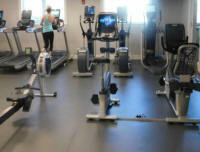 If you want to work out by yourself, you have the freedom of a room full of equipment including treadmills, stationary bikes, free weights and weight machines. Alternatively, you may want to join in on any of the scheduled classes throughout the day -- the morning stretch, body sculpting, Pilates or yoga. You can also arrange a one-on-one personal training session. The spa facilities include a whirlpool and steam room where you can lie back and relax your muscles. There's also a full range of spa services to choose from for those who really want to be pampered. The spa has professional therapists and estheticians available for a wide range of body and salon treatments, including massages, aromatherapy, sea salt scrubs, hydrating seaweed wraps, facials, waxing, and hair styling. Afterwards, you can always dive into the heated, fresh-water pool that lies right outside the door. Please download our menu of Spa and Beauty Salon services and packages. Daily from 8:00 a.m. - 6:00 p.m.